Qualities: source of life, divine nurturance and support, primordial Mother, undivided primal waters, primal trust and nourishment, receptivity. Today is a day for divine nurturance. I gave myself time for a healing massage today. Yes that is what I am doing to nurture myself today. How did I know it would match up so perfectly? How can you nourish yourself today? Well the cosmos says GO FOR IT NOW! So I guess you have permission. You are in alignment with receiving so the potentiality for healings is quite strong. Go deeper than you might previously have chosen to, knowing there is full support for you to embrace these deeper places within. 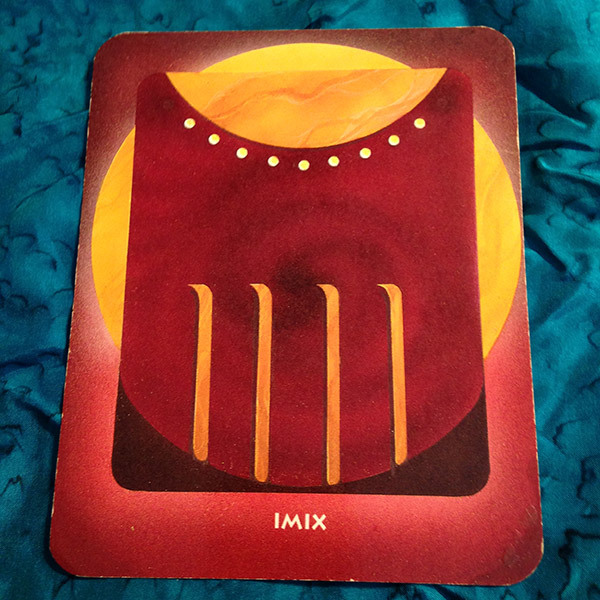 Imix is the first card in the cycle of 20 glyph cards and represents the root source of life, the primal waters from whence we came. Imix tells us that the Divine Mother nourishes and supports us unconditionally. It doesn’t matter who we are…we are entitled to receive that loving support. The more we understand this the more we open to receive the sustenance and begin to trust that it is always available to us. Today I repeat the affirmation and thank the Divine Mother who connects us all in the sweet song of creation.